From the moment you walk in the door, you will fall in love with the breathtaking views of this beautifully decorated condo, named 'Sundance'. This is our family's personal vacation home, so we have furnished and decorated it with all new upscale furnishings and high end electronics so it's not your typical 'rental' condo. No need to keep track of a key, it has an electronic lock customized to whatever personal code you choose. It is on the second floor of a three story horseshoe shaped complex called Ormond Breakers located at 2100 Ocean Shore Blvd, with beautiful landscaping and a well kept pool in the courtyard, which you can see from your balcony. It is an end unit closest to the beach so you have double the windows and gorgeous views of the ocean. The beach is private for residents and guests only of the Breakers so it is never crowded, always quite and peaceful and it is a 'no-drive beach', unlike Daytona beach. KITCHEN - is beautiful with granite countertops and fully stocked with everything you could need. It has a refrigerator with freezer and ice maker, stove, oven, microwave, toaster, coffee maker, crock pot and electric grill for cook outs on the balcony. It also has dishes, glasses, silverware, kids plates and cups, pots and pans, cookware and utensils. There is a high top table that has 4 stools, but can expand up to 6 and a bar with 4 additional stools. And of course there is a box of menus for nearby restaurants for those who chose not to cook on their vacation. LIVING ROOM - features 12 feet of windows directly facing the beautiful Atlantic Ocean with a comfy sleeper sofa, two swivel chairs directly in front of the window for whale watching and everyone's favorite, a large round swivel 'pod' chair you can snuggle up on and watch T or just stare at the ocean. There is a 50 inch plasma TV, with DVD player, digital cable and a Wii game system with remotes and Wii Sports for kids (and adults) to enjoy. There is a balcony with chairs and a table to sit, relax, enjoy your coffee while watching the dolphins swim by. MASTER BEDROOM - is like a spa retreat with a king size bed, chest or drawers, and leather lazy-boy with gorgeous views of the ocean out the large window to wake up to. It has a 36' flat panel TV with DVD player and a printer if you must do a little work while you are there. There is a full bathroom with granite countertops and a new white vanity with enclosed glass and tile shower. 2nd/KIDS BEDROOM - this room is brightly decorated and has a single bed (with a trundle underneath), a bunk bed with single on top (80 lbs. max) and sofa/double futon on bottom. It also has a TV with DVD player, books, games and toys to keep everyone happy and entertained. The bathroom also has granite and a vanity, medicine cabinet and bathtub with a shower. There is also a pack-n-play if needed. There is a linen closet in the hallway fully stocked with all the bath and beach towels for you. POOL/GARAGE/BEACH ITEMS - the one car garage is directly across from your front door and has a coded keypad for you to gain access. It will fit a regular sized vehicle. For larger vehicles and trailers, there is additional parking on both sides and in the rear of the condos. The garage contains all you might need for a fun day at the beach, like chairs, umbrellas, buckets and shovels, toys and boogie boards. The condominium has a beautiful pool in the courtyard and plenty of tables and chairs to relax and read a book on. NEARBY - Daytona beach is just minute, Orlando and Disney World are only an hour and the beach is seconds away. There are a lot of things to do in nearby like shopping, movies, bowling, go-karts, indoor amusement park with laser tag, rock climbing and arcade games, and my kids favorite, Daytona Lagoon, a water park with a wave pool, slides and much more. Marineland is also only 20 minutes away where you can swim with dolphins! This is my family, Team Palmer! I have three wonderful children and two dogs. This was my youngest birthday where we drove 20 minutes away to MarineLand and the whole family had the opportunity to swim with dolphins....It was an AMAZING experience! We feel in love with the absolutely breathtaking views. It was only an hour from our home, so we knew we would get a lot of use out of it. I really enjoyed painting and decorating and quickly became very attached to it, almost like a family member and now her name is Sundance! I promise you will leave Sundance happier than when you arrived. We have a private beach, so it never is crowded and is just steps out our front door. When we want more excitement, Daytona Beach is only seven miles south and Flager Beach is five miles north. Our kids love that Orlando is only an hour away with Disney World, Epcot, Wet-n-Wild, Sea World, Wild Kingdom and many other theme parks. 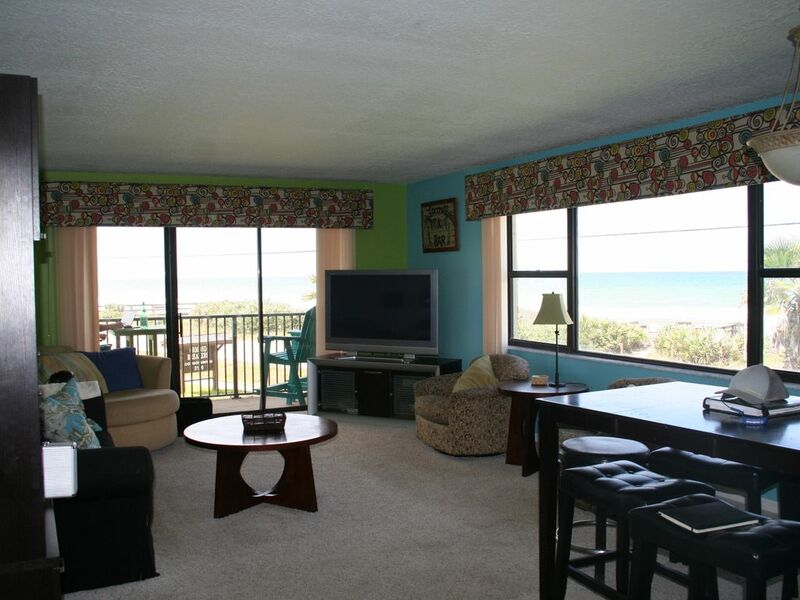 Sundance is located directly across the street from the beach with unobstructed views! All linens and bath towels and beach towels are provided. Laundry room on each hall for personal use. It takes quarters and is .75 - $1.00 for washer & dryer per load. The garage is directly in front of the condo and is filled with beach chairs, toys fishing stuff and boogie boards. There is plenty of seating in front of the 55' TV and panoramic windows. There is a bar in the kitchen with 4 bar stools and a counter high table that can seat up to 6 people. There are 3 TV's, one in the family and one in each bedroom. Over looking the ocean and courtyard with a pool. We loved our stay at Sundance! The furniture is comfortable, and the view is amazing. We loved the deck, the puzzles, the pool, the sound of the ocean at night, the uncrowded and clean beach, and the beach toys. We had forgotten our football, so were glad there was one there. The neighbors were much more gracious than at the last Ormond Beach condo association where we had stayed the last few years. We would love to come back! This condo is beautiful and spacious, there is plenty of room for a big family. The pool is in the sun all day, it is right across from the beach. The owners are great and very responsive. The only reason I did not give it 5 stars is that the balcony is under construction so there were quite a few construction vehicles on the property making it hard to get around and find parking. (the hotel next door does offer weekly parking for a nominal fee). And we woke up to drilling every morning at 8am. We stayed the week and absolutely enjoyed the property. We do a lot of cooking indoors while on vacation and the kitchen had everything you would need as if you were at home. The property owners are very responsive to your requests and questions. The neighbors are polite and keep a close eye on whose coming and going so security is not a issue. We look forward to visiting again. Great location - everything we needed! It was right across A1A from the beach, so we could hear the waves and watch the ocean from the balcony or the fun comfy glider chairs in the living room. The kitchen was great and having beach chairs was a plus since we were visiting family that lived a few miles west. We'd surely stay here again! A wonderful beach getaway with ocean view. Stayed here in November, thoroughly enjoyed beach and pool, which were still warm enough for us! Beautiful ocean view. Very comfy king bed. Spacious kitchen, living room and bedrooms. Great layout. Clean, fresh. Nice new corner couch (not a pull out), nice new dining set (note for those with littles: the chairs have fabric seats). Would love to stay here again. Spent many hours in he sun, sand, tide pools at low tide, surf (boogie boarding, skimming), and the condo pool. We almost had the beach and pool to ourselves most of the time. I came here with my husband and 3 children ages 5, 8, and 9. We all had so much fun on the beach that is just right across the street! There was one rainy/overcast day while we were there, but the house has games, books, puzzles, and movies that kept us occupied! There are also a lot of indoor attractions within driving distance. The highlight of the vacation was the BEACH! It was directly across the street and we had it to ourselves for the most part! Many family memories were made and we would definitely rent here again!! There is absolutely no smoking permitted in the unit!! !